Get a total-body workout on the most versatile and complete combo bench available. The PowerCenter Combo Bench (#GDIB46L) is a Flat Bench, Incline Bench, Decline Bench, 90° Shoulder Press Bench, and Seated Leg Developer all in one. You can see the dynamics of this bench as soon as you glance at the multi-position, telescoping uprights that safely hold the bar for bench exercises. The 6-position Flat / Incline / Decline / Bench features pop-pin adjustable DuraFirm"! seat and back pads that are extra-thick, ultra-comfortable, and will never bottom out. The rock-solid strength and stability of the PowerCenter Combo Bench comes from the extra-heavy 12-gauge all-4-side welded high tensile strength steel mainframe. Strengthen, tone, and develop your knee, thigh, hamstring, and glute muscles with the six-roller Leg Extension / Leg Curl Station included with the PowerCenter Combo Bench. Thick, oversized foam rollers provide complete comfort through heavy lower body routines. Optional stations include a Preacher Curl Station (#GPCA1) for optimum Biceps development and the Lat Pulldown / Low Pulley Station (#GLRA81) for accelerated back and deltoid development. 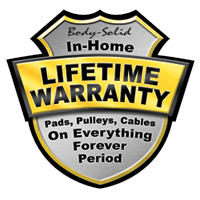 This product features a Lifetime Warranty for in-home, personal usage. Pads, pulleys, cables, frames, and everything in between is covered for as long as you own the equipment. Period. 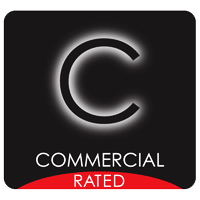 Our Commercial Rated line of products are designed to fit a multitude of applications. Our knowledgeable sales and service professionals will work closely with your business, organization or institution to create the most effective and efficient layout and arrangement of workout stations. Body-Solid offers highly-customizable equipment, accessories and configurations that will meet your exact needs, while providing outstanding value and durability.